More and more couples are considering using a tent for their wedding ceremony and/or reception as a unique alternative to the more traditional church or banquet hall. Before deciding on a tent wedding, you need to consider whether or not you have the space to set up a tent that will accommodate all your guests. Beyond that, we can help you choose a tent that will meet the theme and style of your wedding. Our wedding tents are specifically reserved for weddings - they are never used at agricultural shows, fairs or company picnics. We charge based on the event, not by the day. This pricing option is particularly attractive for couples who want to take advantage of the tent for a rehearsal party Friday night, and a leisurely brunch and gift unwrapping after the wedding on Sunday morning. Download our Wedding Flyer (PDF). 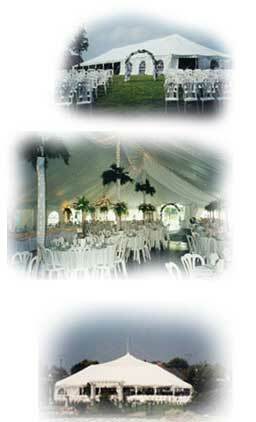 ©2001–13 Drumbo Tent Company Ltd.